BERLIN - Zbig Matulaniec saw a need for machinists in the area when he started his business almost 30 years ago. So he got his whole family involved and began TOMZ Corporation, 47 Episcopal Road, which is now run by his son Tom. “It’s been kept in the family hands and there are some people that have worked here for 30 years,” said Victoria Pereslugoff, marketing coordinator, who explained the company’s name is an acronym for the whole family. T is for Tom; O is for Ola – Tom’s sister and Zbig’s daughter; M is for Maria – Tom’s mom and Zbig’s wife, and Z for Zbig. As a contract manufacturer, the business makes implantable bone screws and medical devices for some of the biggest names in the industry, said Pereslugoff. The Titanium bone screws are for spinal implants and surgeries that correct deformations or injuries, like scoliosis and spina bifida. Throughout the years, Pereslugoff said, Zbig Matulaniec’s ability to maintain a consistent client base from a wide network of business is what sets them apart from other businesses in their field. “We’re consistently busy,” she said. That, and the family atmosphere TOMZ Corporation has helps retain and encourages employees to keep working for them for the long term as they gain experience and familiarity with their craft. 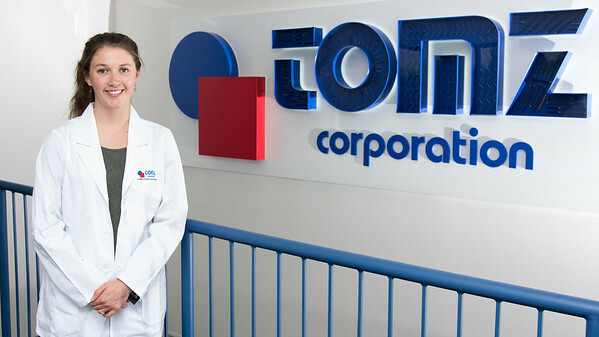 To keep with the times, TOMZ Corporation is always upgrading technologies and the staff of 205 employees are enthusiasts of the trade, meaning they’re always keeping up on the latest techniques. The company will also train employees to fully utilize all their machines, versus one specific task of one, and dynamically adapt their models to industry needs. “There’s not a week that goes by when we’re not getting new machines,” she said. The over 100,000 square foot plant also has a field and roof full of solar panels that allows the company to run one-third of its business off of solar energy. The energy efficiency equates to removing approximately 200 vehicles off the road. Going forward, Pereslugoff said the company will continue to grow as it has expanded seven different times in the past 30 years, with three of those coming in the past 10 years. For more information on TOMZ Corporation, visit tomz.com. Posted in New Britain Herald, Business, on Wednesday, 23 May 2018 10:35. Updated: Wednesday, 23 May 2018 12:03.